There is one thing I can definitely say about the My Little Pony community – they are INCREDIBLY friendly people. Like Rainbow Factory Dash, who started to laugh every time we ran into each other. I’ve never noticed this so much as I did at GenCon this year. Now, as I’m sure most of you who know me know, or those of you who’ve been reading the blog for any length of time know, I deal with anxiety and a heck of a lot of social awkwardness. And because of that, it’s hard for me to just strike up a conversation with people, especially random people I’ve never met that I’m chasing down to take their picture. (More often than not, by the time I worked up the nerve to ask someone for their picture, they’d wandered too far away – thank goodness for Mister Crafty Nerd hunting them down for me and snagging them for pictures!) Or random people I meet in panels. I mean, if there’s a My Little Pony community here in Bloomington, I sure haven’t found it – and even if I did, I’d be a little nervous to just jump right in, hollering “OMG PONIES!” But the My Little Pony fans (or bronies, as I’ll call them for short – I know not everyone identifies as a brony, but it’s just quicker than saying My Little Pony fans every time I want to refer to the group as a whole, heh) at GenCon were just so welcoming and friendly and easy to talk to. I found this out in both of the Enterplay My Little Pony: Collectible Card Game panels I went to, as well as in my wanderings around the con. (One of those Enterplay panels was supposed to be My Little Pony: This Panel is MAGIC, but it got rescheduled…) People commented on how awesome my costume was, and there were a few people who I recognized from when they took my picture earlier in the day. And a magical thing happened – I actually started to talk to people. People I didn’t know. It was amazing. Immediately surrounding me at the first MLP:CCG panel I went to were a bunch of older guys, and a couple of younger girls and their moms who seemed to enjoy the show as much as their kids did. And we all talked. We discussed our favorite episodes, I showed off pictures of my ridiculous collection of My Little Pony plush, we talked about who our favorite ponies were, and wondered what the collectible card game would be like. It was like we were all old friends – and the fact that it was My Little Pony that brought us all together made it even more awesome. A shot from the second MLP: CCG panel I went to. What was even more awesome is that the Enterplay group seemed right at home – even the people who didn’t really know too much about the show, but knew enough to get us all engaged in their presentation. I will say, the group working on the card game is great – I especially love how they made sure to hire fans of the show to make sure that everything was as accurate as possible. They even tossed in some nods to the older fans – and it seemed like they had as much fun making the game as we were going to have playing it. They also gave out lots of amazing goodies – Rainbow Factory Dash and I got one of the rarer Rainbow Dash foil cards, I got a trading card folio, lots of people (including myself) got MLP: CCG playing mats, some got different trading cards or binders, and everyone got a Derpy Hooves foil. 😀 It was a fun atmosphere, welcoming of everyone, from the littlest kid to the oldest brony. I do wish I hadn’t had that nasty anxiety attack on Friday, resulting in me missing the My Little Pony: This Panel is MAGIC panel. Ah well – maybe next year. Speaking of magical things! 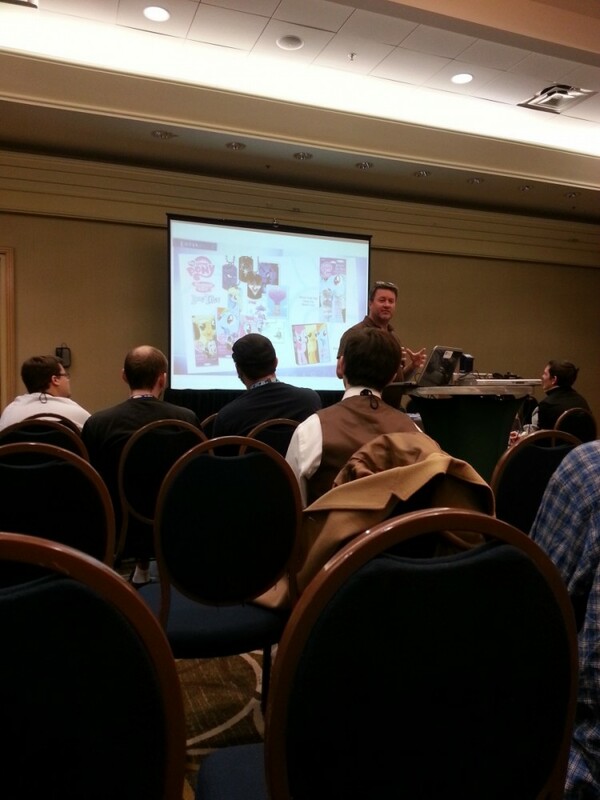 I did get to playtest the My Little Pony: Collectible Card Game at GenCon! And boy, was that fun. The last time I played a collectible card game was when I tried to get my friends into the Sailor Moon trading card game back when I was in college. It didn’t work so well – the game itself was kind of awkward, and it lost its fun factor after about 15 minutes. I also used to play the Pokemon card game with my sister, when we were in high school – I had fun with it, but my sister didn’t quite have the patience for it. 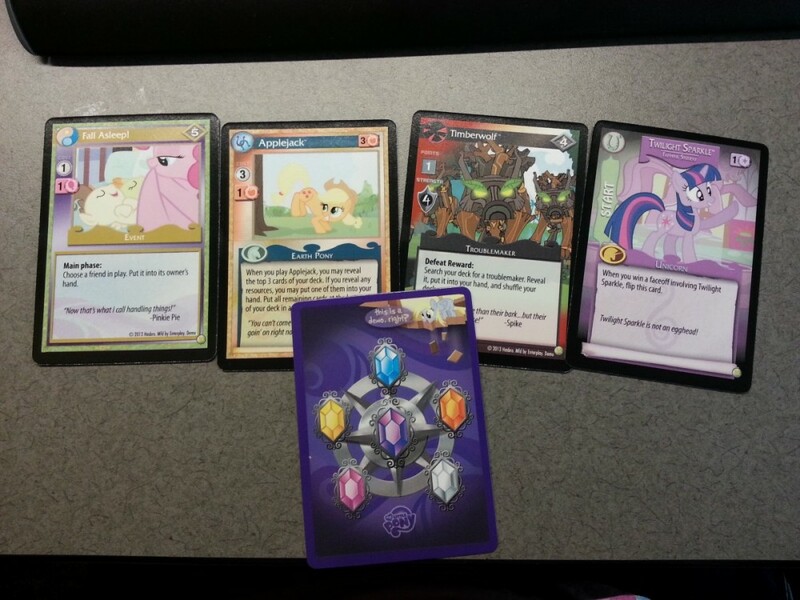 So, when I found out I could get a chance to test out the My Little Pony card game, I was excited. I eagerly paid $12 to secure my spot in the demo tournament, and showed up excitedly on Thursday night for what I think was the second demo tournament. For those of you who are curious about the cards, here’s a look at the demonstration cards we were given – we were told that the final cards would almost definitely not look like this. I’ve got an example of an event card, a friend card, a troublemaker card, and the main pony the deck is themed around – plus a shot of the back of the cards, which made me giggle. I love that they included Derpy Hooves in there! I may take pictures of the entire deck at some point, so everyone can see all the cards. I know that there will definitely be some tweaks to the gameplay between now and November, when the game is officially released, but even in its current state, I enjoyed playing the game quite a bit. 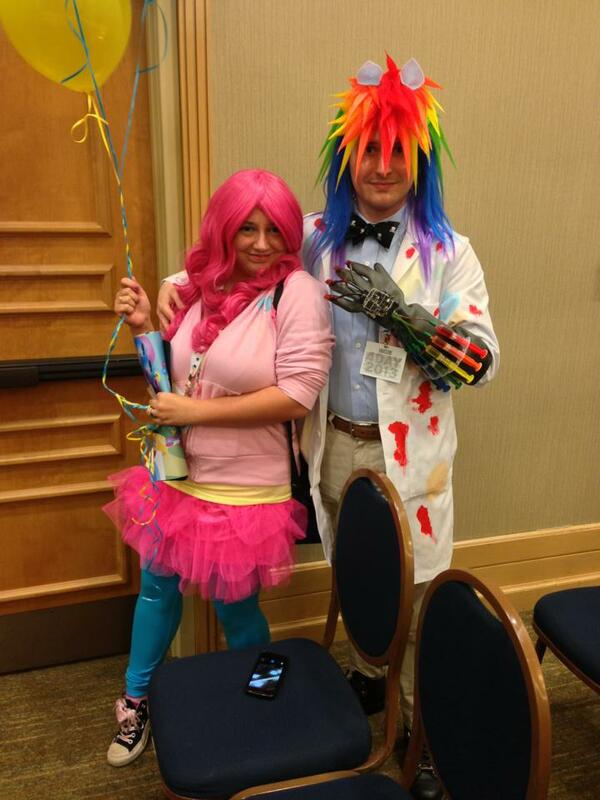 So in short, conventions are indeed magic – and the brony community especially so. 😀 We all have so much fun when we get together in large groups, haha.